When I first came to TidBITS and started getting to know the staff, I was surprised to learn that our own Matt Neuburg, in addition to being a TidBITS Contributing Editor and the guy John Gruber of Daring Fireball has called “the best technical writer in the business,” is also an iOS developer. (This wouldn’t have been as surprising had I known that Matt’s main project of the last few years is his “Programming iOS” books for O’Reilly, the most recent of which is “Programming iOS 6.”) Matt has created three simple, yet challenging games for the iPhone and iPad: Zotz!, Diabelli’s Theme, and LinkSame. If you’re looking for a mental challenge to kill a few minutes, give them a try! Zotz! — If you’re looking for a mental workout, then try the $0.99 Zotz!, a multidimensional matching game for the iPhone. Matt describes it as “an enjoyable time-waster, a form of perpetual practice.” You’re presented with a set of cards with shapes on them. Each card has four attributes: number of shapes, color of the shape, fill, and the shape itself. 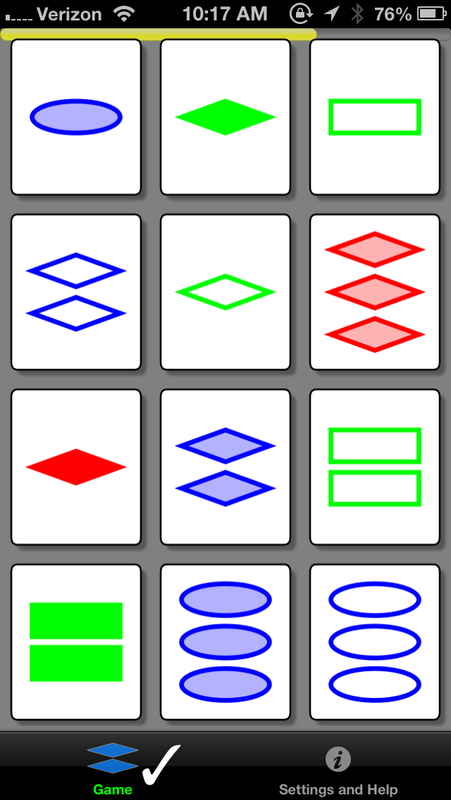 The object of the game is to identify any three cards that are either alike or different for each attribute. The cards are dealt from a deck of 81, and the game ends when all possible triads have been played. How you play the game is easily described but not nearly as simple to wrap your mind around. Luckily, Matt includes a number of examples of valid matches in the instructions. If you get stuck, you can double tap on any card to see the solution. Check out the screenshot below. Can you spot three matching cards? Diabelli’s Theme — Like Zotz!, Diabelli’s Theme is a classic game with a twist. 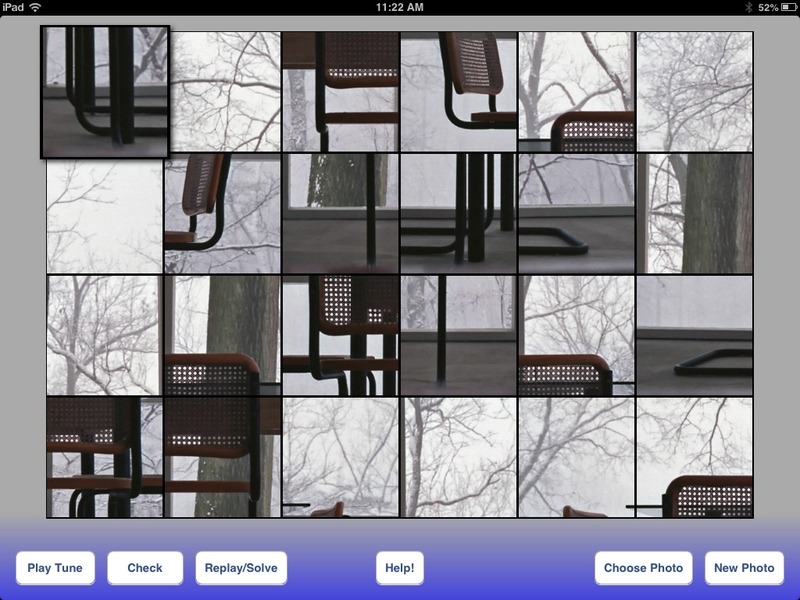 The game presents you with a picture, split into 24 sections, and your task is to put the pieces back in the correct order. To help you in this task, each piece is also associated with a piece of music: composer Anton Diabelli’s waltz that Beethoven famously transformed into 33 variations. If you’re unfamiliar with Diabelli’s Variations, you can listen to it for free on Wikipedia. When you touch a piece of the picture, its associated snippet of music plays, giving you a clue to where the piece might fit, even if you’ve chosen a picture of fog at night, or if your vision isn’t what it could be. If you’re a fan of classical music, or would like a fun way to teach your children how to listen to how music is really put together, then Diabelli’s Theme is a terrific, surprisingly educational puzzle. Diabelli’s Theme is available free for both the iPhone and iPad, with a $0.99 in-app purchase that enables the use of your own pictures. Perhaps an update could provide additional music, or the option of choosing your own pieces as well. LinkSame — Matt clearly likes stretching his brain with non-trivial matching games, and his free LinkSame for the iPad is another entry in that category. Based on the popular but abandoned MacLinkSame by Zheng Xiaoping, LinkSame’s goal is simple. 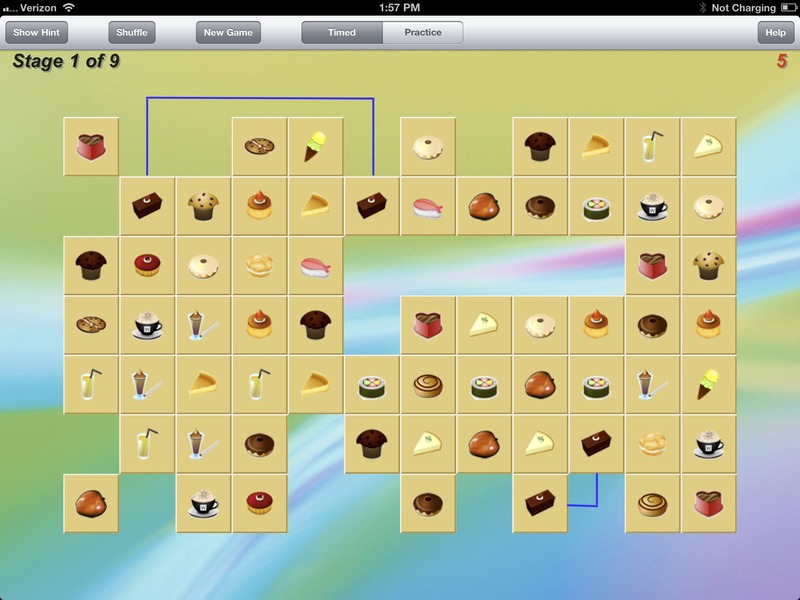 You’re presented with a grid of icons that you must match up with one another to clear the board. The rules for matching are as follows: the tiles must contain the same picture, the tiles must be connectable by no more than three straight lines (which can go out, over, and back from the edges), all lines must be horizontal or vertical, and the lines cannot cross another tile. The blue lines in the screenshot show a couple of possible moves. In my limited experience, I’ve found the best strategy is to find connected matching tiles, then start working on the outskirts and advance inward. LinkSame offers nine levels total, and each level differs in how the tiles slide to occupy the empty spaces left by removed tiles. Although the game defaults to Timed mode, if you prefer a more leisurely approach, you can switch to Practice mode, where there’s no scoring. When playing in Timed mode, you can’t run out the clock, but your score is related to matches and speed. You get 1 point for each matched pair cleared from the board, with bonuses for making multiple matches in under 10 seconds. Conversely, you also lose a point for every 10 seconds of inactivity. If you get stuck, you can request a hint or reshuffle the board, but you lose 10 points every time you do so. There’s a common thread in all three of Matt’s games. None of them are time-consuming and none have a plot. Only LinkSame offers any scoring or time pressure at all, and even that can be turned off. They’re all simple games designed to pass the time and train the mind. If you’re looking to beef up your brain without breaking the budget, give them a try! Another Zotz! match in your screenshot: One solid green diamond, two hollow blue diamonds, and three shaded red diamonds. This is basically the same as the card game Set which I've enjoyed for many years. So Matt reinvented Shisen Sho. I have to take a look at it, but I'm pretty accustomed to playing versions that use the traditional Mahjongg tiles. Zotz! was originally modeled after an existing game, Sets, released for Mac OS X (I wrote my own version because I didn't like the existing implementation); only later did I find out that Sets, in turn, was modeled after SET. LinkSame was modeled after the Mac OS X LinkSame (I wrote my own version because the original was no longer supported, or available); I didn't know that it, in turn, was modeled after Shisen Sho. I don't claim originality — just goodness of implementation. I did think up the Diabelli's Theme idea out of my own head, but I'm sure it's been thought of before too! The number of iOS apps out there is staggering; how likely is it that anyone will come up with anything truly new at this point? That doesn't detract from the fun I have playing my own versions, and for me, that's the point. I'm sorry if I suggested any disparagement. You have apps on the App Store and I don't so good for you! I've always wanted to write an app that could look at a "hand" of Set cards and list all the solutions. I never got very far with the computer vision part. I played around with OpenCV but never figured out how to pull it off. Andrew Tomazos' MindThump 1.0 of 1998 was available for Mac OS 7 and Mac OS 8 (PowerPC) and was pretty good, and it is still seen at macintoshgarden.org. Nikaku-dori (translates to capture-by-two-right-angled-corners) is a really classic computer game (sometimes called Shisen-Sho) and is currently available (and is supported) for Mac OS X at Mac App Store. Isn't another one the single lightly shaded blue oval, the two solid green rectangles, and the three hollow red diamonds? Or am I not understanding how it works? No, because the red diamonds are shaded, like the blue oval, not hollow like the other diamonds in that row. Do you mean to say that my describing the red ones as hollow (no fill) doesn't make them hollow? Oh we'll, that's what I get for trying to do this on my iPad--switching between email and the web browser and forgetting what the picture actually looked like. Buying for the iPhone/iPad could make certain musicians happy. Searching for Zotz in the App Store brings one to a song called Zotz! I was too quick and bought it.